I’m fairly certain people born after 1982 won’t know that Ben Kingsley is, in fact, not the actor’s given name. He is, in fact, the son of a British actress and an Indian medical doctor. Ben Kingsley was born Krishna Pandit Bhanji and at 39 set out to play an iconic role, probably the most iconic of his career thus far: Mohandas K. Gandhi, or as he was known, too, later in life: Mahatma Gandhi. The film itself is a transformative experience. It’s long: touching just over three hours, the film paints the mercurial Gandhi in an honorific light very fitting to his Sanskrit title given to him and distinguishing him from perhaps thousands of other Gandhis living in India and abroad during the first half of the twentieth century. It’s slow: but not boring. The film details several events that helped to guide young Mohandas K. Gandhi, attorney at law, from path of honor, to a path befitting of the savior of a nation. Because that’s who Gandhi was. He helped to broker Britain’s release of India from a three-centuries-long hold economically, religiously and territorially. Through personal experience, Gandhi did something very few humans have ever been able to: expand his reach across a population to make a difference in the outcome of global events. Kingsley, in his Oscar-winning performance, mastered transforming this emotion to the screen. It’s hard to place Gandhi into context because there’s never another film like it. Some films, like 1970’s Patton helped to paint the picture of General George Patton within the frame of his notable achievements. Other films, like 1962’s Lawrence of Arabia come close, but the film’s subject, T.E. Lawrence, doesn’t hold the nation’s back on his shoulders. Nineteen eighty four’s Amadeus is amusing, poignant and provocative, but Wolfgang Amadeus Mozart, didn’t hold the weight of hundreds of millions of people on his shoulders to achieve his accomplishments. Billions of present-day Indians owe their freedom (some might argue their own self-opression) to Mohandas K. Gandhi, attorney at law. It was a perfect collusion of efforts: Richard Attenborough and Ben Kingsley necessarily left a tribute to the singular man. A few notes about this film: Attenborough spent the better part of a quarter-century attempting to created his pièce de résistance. It took him 30 years to finally work around production restructuring, cancellations, director and actor non-commitments and an overall waning of interest from all parties, except for Attenborough. Some might call the delays fortuitous: had this movie been made earlier it would have fallen under direct comparison of Lawrence, since director David Lean was supposed to have helmed both chairs. What has become Kingsley’s calling card might have been given to Alec Guinness, Best Actor in 1957’s The Bridge on the River Kwai, but perhaps best known for playing Obi-Wan Kenobi in 1977’s Star Wars. This pairing overshadows the concept of the meditative Gandhi’s effect on the fate of India. Gandhi is lucky to have cast Kingsley in its main role when the time was prime – it also sends a ripple of metaphor to mirror the procession of the film. Perhaps Gandhi’s shining achievement from a storytelling perspective is its dismissal of Mohandas Gandhi as a perfectly balanced character of will and conscience. We’re taught from a young age that Gandhi was a pacifist, that he avoided violence at all costs and would stage non-violent protests across the country to will the British imperialists into submission. This is most certainly true, but as the movie suggests, and what makes sense within his character, Gandhi took to lay his arms down because he felt that this string of methodology would have the greatest effect on his movement achieving its goals. It’s suggested that had India’s separatist leaders thought a militant resistance to be the most effective means to the ultimate end, that Gandhi would have supported it. It’s with Kingsley’s supreme acting and Attenborough subtle direction that his character both defends and propagates this. We’re also privileged to see the aftermath of Britain’s eventual vacancy of the Indian peninsula, in the form of a religious conflict between Sunni Muslims and Hindis. The conflict’s resolution, as mirrored in an actual territory split, became Gandhi’s mission later in life and would be the eventual unraveling of his life. Kingsley ages gracefully as the man Gandhi, who was never at peace, must like the world around him. This man lived through two World Wars, British Imperialism, Pakistani/Indian religious strife, but as Gandhi was apt to show us, his real burden came at the individual level; when the conductor threw him off the train in South Africa, he stood up and fought back. When South African MP’s beat him to submission, he not only fought back, but he fought with purpose and dedication. So did Attenborough to get his film made. The parallels are poignant. 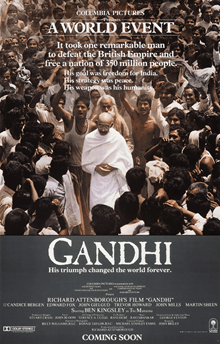 Of the 5 films nominated in 1982, Gandhi was both the obvious choice and the outlier. Against powerhouse directors in the height of their careers, Gandhi had to prove it was a cut above the rest. Had this movie been made in the cycle that produced The Bridge on the River Kwai and Lawrence of Arabia, the Academy might have seen the film as overwrought and opportunistic. Instead, Gandhi is enshrined among the most iconic of all biopics and other 1982 nominees, Tootsie, E.T. : The Extra-Terrestrial, The Verdict and Missing will remain at least second to one of the most determined pictures of the 20th century.